HVAC (Heating, Ventilation and Air Conditioning) controls are on the dashboard and buried deep within, in the air distribution and ventilation system. Here’s a ghost view of the system in a LHD Golf. Air flow direction and cooling is controlled by a 1-of-7 selector and effected by 3 vacuum-operated servos, one being dual-stage. Electrically, the selector (E39) offers insufficient electrical information, so a position sensor must be added. A potentiometer allows stepless detection of the selector’s position through a single, analog input. To allow the node to control the flaps for airflow direction, they must be converted from vacuum to electrical control. Central-locking master actuators cannot be used as they do not hold position when powered off, so would have to be continuously energised at several amps to hold .. which isn’t good. Three vacuum servos in the system are be replaced with a remote-control (RC) servos which hold the programmed position even after power has been removed. An RC servo needs only digital PWM position input and (12V) power, but only when changing position as it holds the last set position firmly by virtue of internal gearing. External limit (micro-)switches serve to set soft limits on powering up the system and for safety to “back-off” or to depower a servo when something goes amiss. The ventilation fan speed switch (E9) sets the fan speed to any one of four speeds from quite slow to the fastest possible. Note that 1 is the lowest speed is the lowest for all ventilation settings except 0 (off). The ventilation fan motor is powered through the switch for the 3 lowest speeds via a resistor network and directly through a relay contact (within the A/C relay) for the maximum speed, probably because it’s a 350W motor and it’d be a lot of current to pull through a switch. The node is to implement PWM drive of the fan motor to eliminate the need for both the resistor network and the separate relay contact. A high-side MOSFET drive will also be more efficient at lower than maximum speeds and may be more efficient even at maximum speed because the slave node will draw current from the battery “busline” near the fan motor, instead of via the central electric panel. 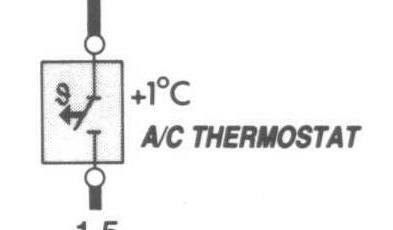 Standard A/C operation relies on a thermo-switch to shut off the compressor when the evaporator reaches 1°C. That works well for frost protection. But it’s not very efficient for cabin temperature control. The desired temperature is set in the standard vehicle by the slide control below the selector (see top picture). It’s an air-blend control that diverts a portion of possibly-cooled air through a heat exchanger before lettting it escape through the vents. So it doesn’t actually set temperature; just the air blend ratio; which also varies with fan speed. A microcontroller such as in the slave node can do much better by replacing the Bowden cable between the temperature slider and the blend flap with an electronic link that operates a servo motor on the blend flap, using a potentiometer to determine the position of the slide. By measuring several temperatures inside the ventilation system and the cabin, the controller can position the blend flap dynamically in response to changes in ambient conditions to achieve a target temperature as set by the slider’s position. The centre position of the slider would equate to 22°C with the coldest at 16°C and the warmest being 28°C. Having a potentiometer gives the flexibility to re-cast the temperature setting slide almost on a whim. e.g. the extreme-left could mean “as cold as possible” and the extreme right “as hot as possible”; up to the physical limits of the HVAC system. 1-Wire temperature sensors connect to their own bus; to a single digital input pin on the node, providing temperatures at the dashboard face, at the dashboard vent outlet, at the footwell outlet, at the recirculation and fresh air inlets, after the evaporator and at the screen demist outlets. One or two humidity sensors can be added to provide the best-possible comfort level with a target of between 50% and 70% relative humidity, with lower levels at higher temperature; except when demisting. A light sensor on top of the dashboard can give a hint as to the heat loading from the sun. Further air quality measurements can be made by CO2 sensors at the fresh air inlet and after the heat exchanger. Fresh air, when it has sufficiently-low CO2 may be blended with recirculated air to maintain ambient CO2 levels below about 600 ppm to help maintain driver alertness. 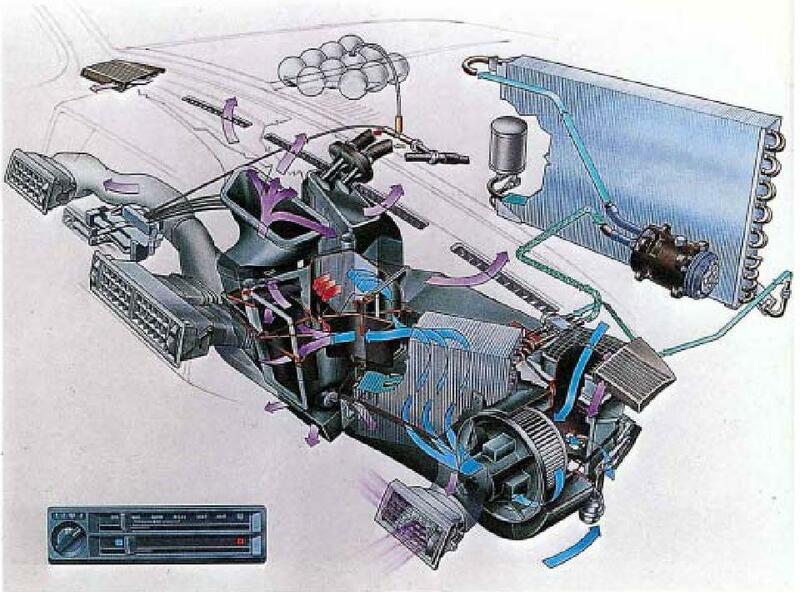 An odd omission from the current-flow diagrams is the illumination of the HVAC panels and fan speed knob.It is in the car! Power requirement is dominated by the 350W fan’s. 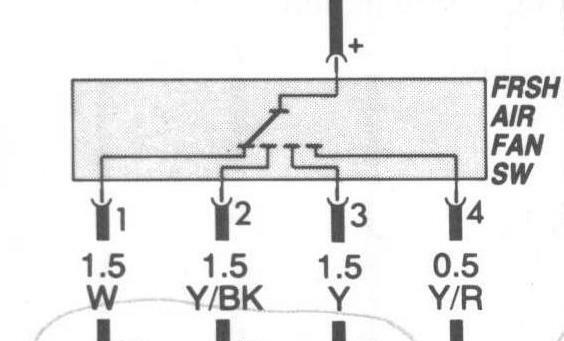 Current flow diagrams show 2.5mm2 wire being used but this is marginal for the air-conditioned RHD models. So increase it to two 1.5mm2 for the short distance from supply, through the node and to the motor, then back to chassis common via the node. The most-significant controller node state that is interesting to others is the command to engage the airconditioning compressor clutch. That command may of course be over-ridden by decisions in the master, or in the node that physically “owns” the clutch. Other states which may be of interest are e.g. light intensity on the dashboard, for automatically adjusting dashboard illumination accordingly. Some soft states that are interesting to HVAC include engaging reverse gear or activating the windshield washers could for the fresh air supply to switch temporarily to recirculation to avoid possibly-unpleasant odours in the cabin. Similarly, knowing road speed can be useful in adjusting ventilation fan speed and perhaps to calculate the fresh air intake flap position. By removing the physical link between the control knobs on the dashboard and the devices which control air flow and temperature, it’s possible to provide an integrated, adaptable do-what-I-mean (DWIM) functionality to HVAC.